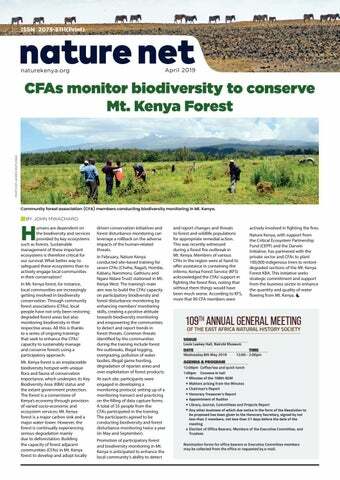 Community forest association (CFA) members conducting biodiversity monitoring in Mt. Kenya. actively involved in fighting the fires. Nature Kenya, with support from the Critical Ecosystem Partnership Fund (CEPF) and the Darwin Initiative, has partnered with the private sector and CFAs to plant 100,000 indigenous trees to restore degraded sections of the Mt. Kenya Forest KBA. This initiative seeks strategic commitment and support from the business sector to enhance the quantity and quality of water flowing from Mt. Kenya. 12:00pm Coffee/tea and quick lunch 1:00pm Convene in hall Minutes of the 108th AGM Matters arising from the Minutes Chairman’s Report Honorary Treasurer’s Report Appointment of Auditor Library, Journal, Committees and Projects Report Any other business of which due notice in the form of the Resolution to be proposed has been given to the Honorary Secretary, signed by not less than 2 members, not less than 21 days before the date of the meeting Election of Office Bearers, Members of the Executive Committee, and Trustees Nomination forms for office bearers or Executive Committee members may be collected from the office or requested by e-mail. Strategic Environmental Assessment (SEA) for Wind Energy and Biodiversity in Kenya BY JOHN KIPTUM AND SERAH MUNGUTI The meeting presented key findings and initial recommendations of the draft Wind Power and Biodiversity SEA. This included updating of sector players on progress that The Biodiversity Consultancy (TBC) and partners have achieved in terms of work done so far, preliminary results, challenges and plan. “The Wind Energy and Biodiversity SEA seeks to identify places critical for the survival of bird species likely to be affected by wind power. It also seeks to identify areas of low biodiversity risk for wind power development; and propose mitigation measures and other management actions that will align with international good practice. The process will make it easier to save nature as we address our quest to grow our economy through wind energy” said Dr. Matiku, Executive Director, Nature Kenya. The SEA is being supported by USAID through its Power Africa program implemented by Tetra Tech. Tetra Tech has contracted The Biodiversity Consultancy (TBC) to lead the SEA process. 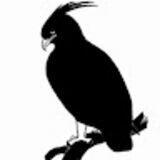 The Kenya Bird Conservation Consortium (Nature Kenya, BirdLife International and The Peregrine Fund) is working in partnership with the TBC. “We still have fires raging in a number of our forest areas, mainly Mau, Cherengani, Mt. Elgon, the Aberdares and Mt. Kenya ecosystems. These sprayers donated today will be distributed immediately to the needy stations to be used during this fire season,” he said. Mr. Lemarkoko called on other well-wishers to support KFS’ conservation efforts. Presentation of the knapsack sprayers to KFS. The Commandant noted that KFS was working closely with Nature Kenya to monitor forest areas through jointly developing programs and monitoring systems. He added that the fire fighting equipment would go a long way in supporting KFS’ response and fire suppression activities. NATURALIST A rare bird at the museum! Nairobi National Museum is an excellent bird-watching site, especially for beginners. In late February and early March, however, it was drawing experts and amateurs alike from far and wide – to see a Pied Flycatcher, the first record for Nairobi! his column points out the brightest stars and planets and most distinctive constellations in the early evening and predawn skies. You will see many more stars on a clear night in a dark location away from urban lights. It’s safe to use binoculars to look at the moon, planets and stars. It’s only the sun that you must avoid. The European Pied Flycatcher is a small bird, black and white in colour – appearing brown and white in full sunlight. It nests in Europe and northwestern Africa, and normally migrates to West Africa in the cold season. In Kenya, a vagrant Pied Flycatcher was seen in 1965 in Kakamega Forest. More recently, Pied Flycatcher were recorded in Kakamega forest by Bern de Bruijn in 2002, and two sightings by Nathan Hentz and James Bradley in 2017. This year, two sightings came almost simultaneously: On February 24, David Guarnieri and Ben Mugambi saw three Pied Flycatchers on Mount Elgon. And on February 27, Kevin Gichuki found the bird at the Nairobi National Museum botanic garden, the first record east of the Rift Valley! Kevin Gichuki alerted other birders who rushed to the museum. At first it was thought to be a Semi-collared Flycatcher, another migratory bird that occasionally passes through Kenya. However, photos taken by John Mwacharo, Sidney Shema and other birders and quickly shared revealed the bird as a European Pied Flycatcher. The records have now been sent to the East African Rarities Committee for approval. More than five records will mean that Pied Flycatcher is no longer a rarity for Kenya – but it’s still a rarity in Nairobi! The Pied Flycatcher seemed comfortable at the museum, and was seen again and again until mid-March. The European Pied Flycatcher that was spotted at the Nairobi National Museum grounds. Gemini on the 11th and near bright Pollux in Gemini on the 13th. High in the northeast, the bright star Regulus is at the heart of the constellation Leo the lion. The moon is near Regulus on April 15 and near the blue-white star Spica on the 19th. Two iconic constellations rise in the east on April evenings. The Plough or Big Dipper is low in the northeast. Crux, the Southern Cross, is low in the southeast. Morning Sky Four of the visible planets are in the predawn sky. Golden Jupiter rises in the east during the evening and sails across the sky during the night, escorting the constellation of the Scorpion. With binoculars on a clear, dark night, you may see up to four of Jupiter’s moons as bright dots on each side of the planet. The moon is near the star Antares, the Scorpion’s fiery eye, on April 22, and near Jupiter on the 23rd and 24th. The planet Saturn, much fainter, is high in the east at dawn. Brilliant Venus is now low in the sky above the sunrise. Little Mercury rises above the horizon, but does not quite reach Venus. The moon is near Saturn on April 25 & 26, and near Venus on May 2 & 3. Moon, April 2019 April 5 – new moon. Look for a slender crescent in the west on the 6th. April 12 – first quarter (“half” moon overhead at sunset). April 19 – full moon. April 26 – last quarter (“half” moon overhead at dawn). Bird ringing every Tuesday morning (check with Ornithology section, National Museums). Act now to save African Vultures! Africa’s vultures are under serious threst of extinction. These majestic birds need our help to remain in the skies. Support Nature Kenya’s vulture conservation work by making a donation today. Every contribution (big or small) matters and together we can prevent the catastrophic demise of ‘earth’s clean-up crew’. Download free QR Readers from the web and scan this QR (Quick Response) code with your smart phone for pictures and more stories.